The massive North East Link road project looks set to deliver Melbourne’s biggest ever boost in bike infrastructure investment. Plans released this week include an estimated $230M of new active transport routes and upgrades. The biggest gain is the provision of the eastern bike corridor, a direct commuter route into Melbourne’s inner north from the Chandler Highway along the new Busway on the Eastern Freeway. The route requires the construction of a new bridge over the Yarra, as shown in the below artists impression. A number of other important gaps in the network will be addressed, including the missing link two new Yarra River crossings and completing missing walking and bike riding links play a key role in improving all forms of transport for Melbourne. As well as enhancements directly included in the North East Link Project, a number of complimentary upgrades will be provided in conjunction with NELP, including upgraded routes to LaTrobe University. There will also be another new bridge over the Yarra in Heidelberg at the foot of Yarra Street to provide a vital east-west river crossing instead of hostile Banksia Street. NELP calculates that about 25 km of new and improved routes will come as part of the package. The upgrades are understood to be included in the reference design for the project that will go to tender after the state election. The new route along the Eastern has long been discussed due to the problems with the indirect route along the Yarra River. As a result of the construction of the Busway along the freeway, the eastern bike corridor can now be delivered. The designers faced some critical challenges, which appear to be overcome, with underpasses and acceptable gradients. New underpasses at Bulleen Road and Doncaster Road to bypass traffic lights. A key challenge resolved was the steep climb to Belford Road in Kew. 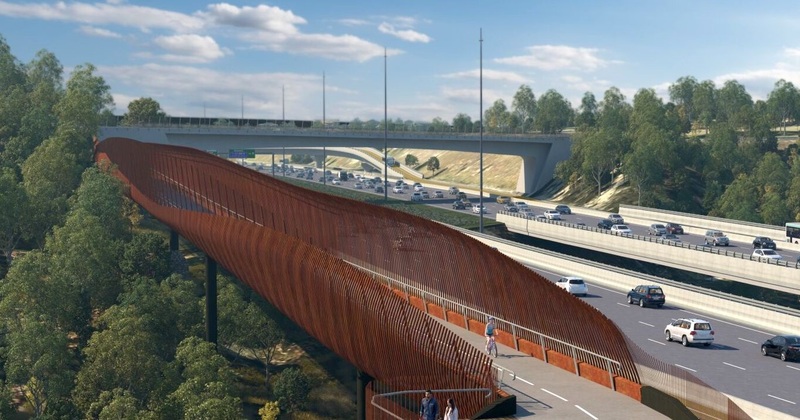 The reference design now includes a new 500-metre bicycle path on the north side of the Eastern Freeway at freeway level (separated by a crash barrier and screen) and under the Belford Road bridge. There is now also a quicker, more direct route under Burke Road with a more direct route for riders travelling between the east and west by extending the path next to the Doncaster Busway under Burke Road. This new path would be approximately 700 metres shorter than the existing route around Burke Road Billabong, saving bike riders two to three minutes in travel time. A new bike riding route along Lower Plenty Road. This path connects Banksia Park to Bulleen Road. A new walking and bike riding bridge on the eastern side of the Bulleen Road overpass at the Eastern Freeway. This will mean safer and easier crossing of the freeway, linking the new Bulleen Road path with the residential areas south of the freeway.